For the Process Lasso Documentation click here. Did you know? Process Lasso has been around for over 15 years! Which edition should I download (32 or 64, Workstation or Server)? Process Lasso’s installer auto-corrects if you get the wrong edition or bit size (32 or 64), so have no worries about the right download link. Process Lasso Server Edition will always install on all Windows Server OSes. The normal workstation edition will otherwise install. Which license type do I need? For Windows workstations such as Windows 10, please buy a Workstation license. For Windows Servers, such as Windows 2016, please buy a Server license. The correct edition of the product will install no matter which download you select. Windows Server OSes require the Server Edition, so it will install on them. You can check which edition was installed via the product About dialog, installer caption, and other areas. Yes! We stand behind the quality of our products and will refund 100% of your money for any reason. You have 30 days from the date of purchase to request a refund. Are free updates included with purchased licenses? Licensed users are entitled to product updates within their subscription period. The period can be annual or lifetime. In the case of lifetime license, the user is entitled to all updates, including new major product versions. What are the installation requirements for Process Lasso? Workstation: Windows 7, 8, 10. Server: Windows 2003, 2008, 2008R2, 2016, 2019. Memory and disk requirements are negligible. How do I activate Process Lasso Pro? Open your Process Lasso GUI, navigate to the Help menu and select ‘Activate this software’. Paste your license activation key (see Order History to find yours) into the dialog. Then click ‘Activate now‘. If you do not see options to Activate, then the product is already activated. You can confirm in the Help/About dialog. Does Process Leave any changes after uninstalling it? No. Process Lasso does not system modifications that persist after it is uninstalled. Will I lose my license if I migrate to a new computer? No, your license can come with you. Simply install and activate on your new PC *after* you have uninstalled Process Lasso from the prior one. The activation system will allow a certain amount of re-use. If you ever do have troubles, contact us and we will get you going again. What do the system tray icons mean? Please see this page for a complete description of all system tray icons. Is there a comprehensive list of features? See this link for all Process Lasso features. Process Lasso is too complex, do you have something simpler? First, remember that you don’t need to understand or use all the advanced features of Process Lasso. You can simply install it and forget it. ProBalance and Performance Mode work out of the box. CPUBalance – is a simpler rendition of Process Lasso focused on ProBalance only. ParkControl – Includes the Bitsum Highest Performance power plan, some power plan automation such as Dynamic Boost (similar to IdleSaver), and other features. Will ProBalance degrade performance in any way? The ProBalance algorithm is designed in such a way that it will never degrade your system performance, only improve it. It is extremely conservative. For instance, one of it’s many criteria (by default) is a process must be of normal priority class. Most audio apps set themselves to a High priority class. Thus, this exclusion was added, as it is assumed the application that sets it’s own priority class knows best. Worst case if ProBalance did take action on some important process, you can always exclude it, but I very rarely hear of this due to the built-in exclusions and conservative nature. Should I rank processes in importance to me, changing their priority classes? Absolutely NOT. Do not do this. ProBalance will handle priority class adjustments that are necessary, if any are. Most of the time it will take no action since it is designed to be conservative and has numerous criteria that must be met before it ever makes a marginal, temporary change to a background process’s priority class. Users should not try to rank processes in importance to them or make too many tweaks to process priority classes! You will do more harm than good. Can I limit memory use of applications? Restricting memory consumption is problematic. If a process needs to go beyond some threshold in virtual memory consumption then your options are (a) to deny the allocation, certainly resulting in an unrecoverable exception in the application, or to (b) stall the application while you wait for some other condition to be met (like a reduction in total virtual memory use). Neither is a good option. Of course you can ‘trim’ the virtual memory, but that isn’t going to be effective if the virtual memory is actively referenced, it will just get paged right back in as soon as it is referenced. This is normally never a good idea as Windows will page out unreferenced virtual memory anyway. Process Lasso does offer another option, setting a Watchdog rule to restart (or just terminate) a process if it exceeds a virtual memory use threshold. That may be the best and most proper action in many cases. Is Process Lasso useful for my real-time applications? Absolutely! For instance, Process Lasso has been very popular by Audiophiles because it’s intelligent algorithms, namely our proven and famous ProBalance algorithm, will keep background processes in check to ensure that maximum CPU resources go to your Audio applications. Further, it has power plan automation, and using our Bitsum Highest Performance mode, you can ensure your CPU is always in a state ready to execute code. Other intelligent algorithms and user-created rules can ensure a smooth and consistent experience for your real-time applications! I don't see a performance boost, is it working? First, let us be sure your expectations are correct – no product is a panacea for all system problems, and certainly not all use cases benefit equally from Process Lasso’s automated tuning. However, ProBalance does always keep you protected from that ‘worst case’ scenario, which you may encounter at some point, and it will save you from an improper shutdown. ProBalance also does not act just to pretend to be doing something. It acts only when necessary. So if you are barely taxing your system, you aren’t going to see much difference in responsiveness. However, during times when you have your CPU loaded up, you will see a dramatic increase in responsiveness if the problem is CPU bound and ProBalance is able to cope with it. Sometimes the issue is I/O related, like waiting for a hard drive, but when it is CPU related, ProBalance addresses it. Note that the Automation Features are ‘utility features’, so if you need them, then you need them. They don’t relate to this answer. How do I force an application to make use of under-utilized CPU or GPU cores? A single thread can’t be externally split into multiple threads, thus you can’t force use of unused CPU or GPU cores. You could force that single thread to be swapped between the CPU cores, but that would only decrease performance due to the switches, and have the same total CPU utilization. The application has to be programmed to utilize multiple threads in order to make use of all cores. So you might say, “Ok, then why didn’t they do that?”. Well, some actions are linear in nature. In fact, many are. For instance, if I’m adding 2+2=4, it’s really hard to break that up into multiple threads. The same goes for use of the GPU. The application has to be programmed to use it, you can’t force it to change it’s characteristics later. This is why the performance of individual CPU cores still matters. If you have single-threaded CPU bound load, you can have 256 CPU cores, but only 1 will be utilized, and it’s individual performance will be the system max. The core utilization graphs are not showing. What's up? First, make sure they are enabled in the View menu (if Process Lasso). Second, make sure you have the right bit-size. This may require a product reinstall. Otherwise, your performance counters are in some way corrupted and there is little else that can be done. The command ‘lodctr.exe /r’ is run for you to try to repair this condition if Lasso finds it to be the case, so all that can be done is done. 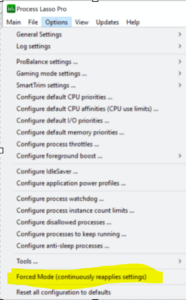 I have an active PC, should I disable logging? Yes, if you have an active PC, you may want to disable certain Process Lasso log events like process creation/termination, or disable logging entirely. For a highly active PC or server, it can be resource consuming. Also remember that you do not need to have the GUI running all the time since the stand-alone core engine (processgovernor.exe) does everything that is important. What is Performance Mode (formerly 'Gaming Mode')? Process Lasso is great for games and other applications that need close to real-time performance. Performance Mode (formerly Gaming Mode) configures ProBalance and the system power plan in such a way as to be best equipped to run games or other resource intensive applications. How does Process Lasso's Keep Awake work? Process Lasso’s Keep Awake works by issuing a power subsystem API call to inform the system that activity is still occurring. It does NOT do any ‘dirty hack’ like emulate keyboard input, as such is not necessary. It will issue this call once a minute at minimum, more if required. Is ParkControl Pro included in Process Lasso? Can I use both together? No, it is not included, and yes, they are designed to run together. Basically, ParkControl Pro has features not present in Process Lasso, such as a dynamically changing system tray icon that reflects core parking status. Going forward, there will be more differences. They are designed to work along-side each other, so when ParkControl Pro is installed, Process Lasso’s ‘Core parking’ tool will actually just open ParkControl Pro’s window. This can lead to the perception that it is ‘within’ Process Lasso, but the only thing within Process Lasso is a more limited rendition of ParkControl (no Pro). Should I micro-manage CPU core assignments (CPU affinities)? In some cases, yes, but it depends on your reason, and you need to be smart about it. If your goal is increased performance, remember that the Windows OS CPU Scheduler tries to manage which threads are on what cores itself, and it’s not dumb. So, when you micro-manage CPU affinities, you are second-guessing it. This can only be appropriate when you are certain of what the loads are going to be and know what you’re doing. We do NOT recommend limiting the CPU affinities of ALL processes with a broad rule like . ; we also don’t recommend limiting the CPU affinity of system or security software. What is the best setup for real-time uses like audio? There is no special setup, just install and go. I will note that we now have CPUBalance as well – which is ProBalance isolated from the other features. For many audio users, especially those who already have optimized PCs and don’t need all that Lasso offers, this may be the preferred solution. Read at https://bitsum.com/cpubalance/ . Should I raise the priority of my application? Probably not. The best practice is to approach it from the other direction – lowering priority classes of anything that might interfere with your application(s). Generally, you should simply let Process Lasso’s ProBalance dynamically lower the priority class of problematic background processes. You can also manually lower the priorities of processes that could interfere with your application. This approach of lowering priorities is much more effective than raising the priority class of your desired application. In fact, setting a ‘High’ priority class normally doesn’t yield any advantage in performance. It is also best to let ProBalance do it’s thing rather than make too many custom tweaks to prioity classes. Too many custom tweaks may cause complications. No change is going to substantially reduce the execution time of your application. ProBalance’s goal is to simply maintain system responsiveness during high loads and/or prevent background processes from interfering with your primary application. Do I need Process Lasso on a new computer? Modern CPUs are not actually getting very much faster, they are growing parallel (adding cores). This is because we hit the limits of physics. Now, since a thread can only execute on one core (it can be seapped around, but it can only execute on a single core at a time and can’t be broken up, and most software still has single-threaded or multi-threaded CPU bound occurrences, it is more improtant than ever to have Process Lasso’s ProBalance algorithm, and it’s automation on top of that for custom CPU affinities. Therefore, the answer is that you need Process Lasso on modern computers more than ever! My process rules and settings don’t seem to stay in effect, what can I do? Some processes change their own CPU affinities, or are acted on by another application. In these cases, you need to turn on ‘Forced Mode’, at the bottom of the Options menu. This will continually reapply the settings you’ve chosen, something that is otherwise not done to prevent any type of ‘settings fight’ with an application. Still no answer? You should contact us. But there is also the legacy FAQ if you want to keep searching.